MSR Whisperlite International. The upgraded Whisperlite International multi-fuel stove takes advantage of nearly 20 years of proven field use and feedback to make one of our most versatile stoves even better. The most notable improvement is a one-piece, stamped stainless steel leg assembly that boosts stability and simplifies maintenance while also reducing weight. Combined with a collection of subtle engineering refinements to boost overall efficiency, the WhisperLite International stove will remain the top choice for globetrotting backpackers seeking lightweight and compact multi-fuel versatility. 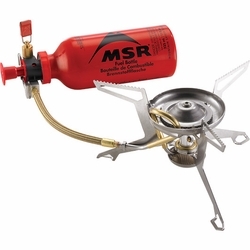 Compact: Folds small and fits inside most MSR� pots.